Splendido Taal Golf and Country Club; it sure gets windy here! One of the most frequented spots for visitors and tourists a like, is Tagaytay City in Cavite, at the top of Tagaytay Ridge. The ridge has a spectacular panoramic view of Taal Lake, which is also a lake on an island, within the lake of the Taal Volcano crater. The temperature here is a few degrees lower than the lowlands which offers a respite from the scorching heat of the tropical climate. 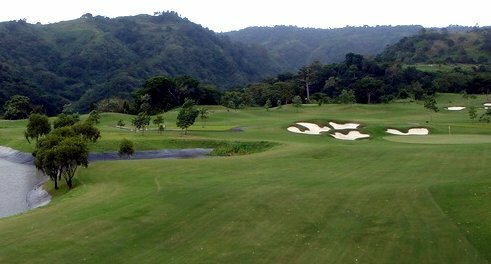 Golfers to Tagaytay also have a chance to have a round of golf in the rustic and cool atmosphere of Splendido Taal Golf and Country Club. 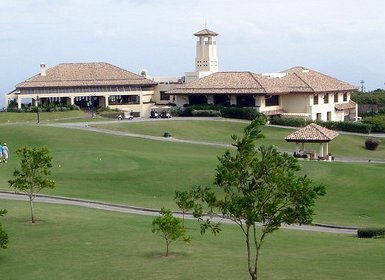 Splendido Taal Golf and Country Club features an 18 hole par 72 all weather championship golf course designed by Greg Norman. It’s located in 152 hectares of manmade valley and has a splendid view of the Taal Lake and Volcano. The construction of the course itself is an achievement of epic proportions. It was said that mountains were literally moved to build this masterpiece, 13 million cubic meters of earth. The hilly terrain and ravines of this course make any round at this course quite a challenge. The course has a few gnarly changes in elevation and measures 6,997 yards from the gold tees, 6,654 yards from the blue, 6,000 yards from the white and 5530 from the red tees. The greens are very difficult to gauge and roll fast and well. Very often when putting, you find that just when the ball begins to slow down and you think it is going to go into that ultimate 4 inch wide hole, it swerves away, maybe it’s just me! However, the extra “challenge” when playing at this course is the wind, which tends to make the course play much longer than the advertised lengths. It is a pleasant course if you are fond of hitting your driver a lot and you will have to hit it often and hit it true, seeing as the fairways are long and greens deep. A very typical Greg Norman design, if you were to ask me. The course’s signature hole is the Par 5 #2 hole which feature a 220 yards carryover ravine and a 90 degrees dogleg that swings right. Locals call this ravine the “Donation valley” for good reason as many have donated their balls into it. As a novice, this hole rocks me right down to the core as I teed off and watched my ball headed straight into the abyss of the ravine! 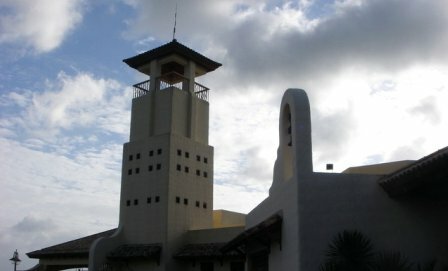 The clubhouse is designed around a Spanish-Mediterranean theme that makes you feel right at home. The lockers are centrally air-conditioned with Jacuzzi, Sauna and showers. They also have massage rooms to soothe those aching muscles after a tiring round of golf. The food here is excellent as well, but the prices are also excellent, comparable to what you find in the posh restaurants in the Greenbelt area in Makati. Apart from the pricey food, overall the course has great potential and provides a true test of your abilities. My advice is just to not get too carried away with trying to hit the ball too long and play from the appropriate tees based on your skill and you will have a great time up here in Tagaytay. For a round of golf here, you can book a round of golf here. How do I get to Splendido Taal Golf and Country Club? 1. The South Superhighway. Take the highway from Makati and turn off at Carmona Interchange. Turn right using the overpass and carry on along Governor's Drive until Aguinaldo Highway. Here, turn left to Aguinaldo Highway and proceed to Tagaytay City. At the roundabout, turn right and keep on this road to Splendido Taal around three kilometers after Tagaytay City. 2. Using Coastal Road. Take the coastal road from Roxas Boulevard in Pasay City. Turn Right onto Aguinaldo Highway in Bacoor and carry on to Tagaytay City. Take the same route when you reach the Tagaytay roundabout. If you would like a round of golf, have a look here for some great rates and tee times. Have you played Golf at theSplendido Taal Golf & Counrty Club?